Has Disney Been 'Lion' About Jeremy Irons' Singing Voice? It's one of the more memorable moments from Disney's The Lion King. 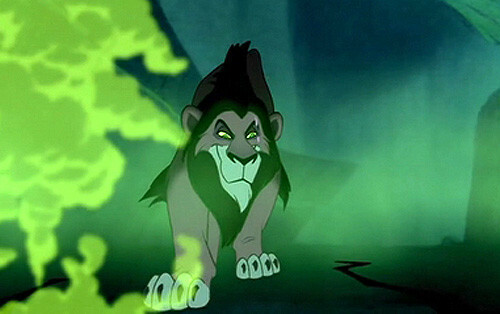 When Scar reveals -- in the song "Be Prepared" -- his plan to murder Mufasa. It's hard to single out which element really puts this musical number over the top. Tim Rice's witty lyrics. Those goose-stepping hyenas or Jeremy Irons' sinuous vocal performance. But here's the thing: The Academy Award-winner didn't actually sing "Be Prepared" ... Well, not all of it, anyway. "Jeremy developed vocal problems while he was recording that number for The Lion King," veteran voice actor Jim Cummings explained. "So the producers asked me to come in and replace Mr. Irons. Sing the last third of 'Be Prepared' in his place." Believe it or not, Cummings has done this a lot over the course of his career. Stunt singing, Jim calls it. Quickly stepping in and providing the singing voice of an animated character when the celebrity who was initially hired for this role isn't really up to the task. "That's what I did on Anastasia. Christopher Lloyd had trouble with the song that Rasputin was supposed to sing in that animated feature. So I sang in his place," Cummings continued. "Likewise on Pocahontas, Russell Means wasn't really up to singing Chief Powhatan's song. So Disney brought me in to stunt sing for him as well." Mind you, singing comes easy to Jim. Back when he lived in New Orleans in the early 1980s, Cummings sang and played drums in Fusion, a regionally successful rock band. But truth be told, as much as he loved music, that wasn't the part of show business that Jim really wanted to be in. "As a kid, I just loved cartoons. And as the credits went by, I'd study those names and then try to figure how I could get hired to do what Mel Blanc and Daws Butler did. Create all of these great voices for animated characters," Cummings said. Figuring that it would be easier to break into the voice acting business if he relocated to the West Coast, Jim packed up his family and moved from New Orleans to Anaheim, Calif. where Cummings was managing a video store when opportunity literally walked through the door. "One of my customers had produced this low-budget horror film," Jim remembered. "So I slipped him my audition tape and asked this guy that -- if he knew of anyone who was looking for new voice talent -- to please pass along my tape. And God bless this guy. He actually did it. Which is how I wound up with my very first job working for Disney." "And what role was that?," you ask. Appropriately enough, it was another lion. Lionel the Lion, to be specific. On the Disney Channel's 1985 live-action / puppet show, Dumbo's Circus. "That was the show that really got me started in voice acting. By the time Dumbo's Circus wrapped production of its 120 episodes, I had an agent and I had scored my first feature film gig. Which was voicing a bullet as well as a couple of weasels in Who Framed Roger Rabbit. And then -- from there -- "Well, I've done a lot of other stuff for Disney," Jim said. 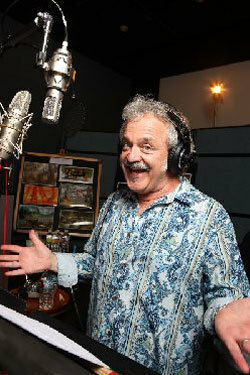 Jim Cummings recording dialogue for Disney's new "Winnie the Pooh" animated feature. Photo by Eric Charbonneau. Copyright Disney Enterprises, Inc. All rights reserved. And Cummings ain't kidding. During the late 1980s / 1990s, Jim voiced countless characters for the "Disney Afternoon" shows. He was Fat Cat and Professor Nimnul on Chip n' Dale Rescue Rangers. Not to mention Don Carnage and Louie on Tailspin. And let's not forget about Cummings voicing the title characters for Bonkers! and DarkWing Duck. But of all the Disney characters that Jim has voiced, his favorite -- more importantly, his most lucrative and long-lasting gig -- has obviously been Winnie the Pooh. "Sterling Holloway, the actor who had originally voiced Pooh, decided to retire in the mid-1980s. Disney decided that they wanted to continue this character with their New Adventures of Winnie the Pooh TV series. So they held auditions and I eventually got the part," Cummings said. "But I just thought that this was a one-time thing. I never ever dreamed that -- nearly a quarter century later -- that I'd still be voicing Pooh. Or that -- along the way -- I'd wind up voicing Tigger for all of Disney's Winnie the Pooh projects as well." So over the past few months, Jim has popped up a number of times at your local multiplex. He's voiced both Pooh and Tigger in Walt Disney Animation Studios' most recent release. And over this past weekend, he could be heard voicing three different parts in the No. 1 film in the country. Which is the 3-D version of Disney's The Lion King. "As I said earlier, I did some of Jeremy Irons' singing in 'Be Prepared.' I'm also the voice of that mole who tells Mufasa that the hyenas have invaded the Prideland," Cummings continued. "And speaking of hyenas, I'm the guy who voiced Ed. Who doesn't actually ever say anything. He just laughs at whatever is going on around him." Which -- you have to admit -- sounds like kind of a challenge for any voice actor. But Jim is quick to credit Roger Allers and Rob Minkoff, the co-directors of Disney's The Lion King, for helping him get a handle on how to voice this hyena. "Roger and Rob basically created this laundry list of things that they wanted Ed to emote in this movie. Easy-to-identify emotional reactions like 'That was a close one' or 'I'm not so sure about this, guys. Maybe we better get out of here,' " Cummings explained. "And my job was to then translate whatever Ed was supposed to be feeling at that point in the story into a laugh." And given that Allers and Minkoff had been so helpful to him when he was struggling to get a handle on how to properly voice Ed the Hyena, Cummings was quick to come to their rescue when the Lion King directors were trying to sell Nathan Lane and Ernie Sarbella on a new song that they wanted these Broadway vets to perform in this animated feature. You see, Timon and Pumbaa originally had this song in The Lion King called "The Warthog Rhapsody." Which -- while it was funny -- didn't exactly fit that moment in the movie where these two misfits initially meet Simba. So Elton John and Tim Rice quickly threw together another tune for these characters that then keyed off of this phrase that one of the guides who rode herd on Disney's 1991 research trip to Kenya kept saying over and over again: Hakuna matata. "So they hired myself and Rob Paulsen -- who did the voice of Yakko Warner on 'Animaniacs' -- to sing the demo of 'Hakuna Matata,' " Jim remembered. "Rob sang the part of Timon while I did the voice of Pumbaa. And then they mailed that tape off to Nathan and Ernie." So imagine Cummings' surprise when he sees the finished version of "The Lion King" and -- when "Hakuna Matata" comes on screen -- Lane and Sarbella are doing exactly what he and Paulsen did with this song. The same rhythms, the same phrasing, right down to the way that Timon and Pumbaa handle the song's throwaway lines. That actually happens a lot in Hollywood these days. Professional voice actors are hired to record a temporary demo track. Which then serves as a performance template for whichever celebrity that studio execs actually want to hire to voice a particular role in their new animated feature. But Jim is fairly philosophical when it comes to this issue. "Look, I take the work seriously. Which is why I always swing for the fences whenever I voice a character. But that said, I don't take myself all that seriously," Cummings said. "Which is why I don't sweat studio-level stuff like this." Besides, it's not like Jim is actually hurting for work these days. In addition to continuing to voice Pooh and Tigger for any Winnie the Pooh projects that Disney has in the works, Cummings has an ongoing gig with Mickey Mouse Playhouse voicing Mickey Mouse's longtime nemesis, Pete. And Jim just did some work on Sophie the First, a brand-new pilot for Disney Junior. But this week, Jim is out thumping the tub for The Lion King 3-D. Which -- right after this acclaimed animated feature finishes up its limited theatrical release on September 29 -- the Disney Digital 3-D version of this movie debuts on Blu-ray October 4. "This has been a fun film to be associated with over these past 17 years," Cummings concluded. "And I'm not lion."